The opening shot of Betty in Blunderland shows our mesmeric heroine peeking mischievously from her curtain-sheathed hiding place; she winks, and delivers her now infamous, trademark “boop-oop-a-doop” spiel, which was propagated further by Marilyn Monroe’s indelibly ditzy number in Some Like it Hot (Billy Wilder, 1959). This trademark routine begins another surreal foray into the unknown for Betty, who (at least before the Hays Code began to tyrannise Hollywood for the “good” of public morals) embodied the quintessential spirit of the burgeoning jazz era. Ranging from the whimsical, almost improvisatory imaginings of the patriarchal Max Fleischer, through to the post-Code shorts in which Betty was stripped of her curves and attitude, Betty Boop cartoons always have, at heart, a fearlessly inventive nucleus – in the blink of an eye, the everyday can (and usually does) morph into the unreal. Betty in Blunderland is one such hallucinatory outing; a short, sharp shock laced with Fleischer’s whimsical, though at times suppositious touches. Betty Boop is stretched out on her living room floor, assembling a Wonderland jigsaw puzzle. Suitably placated singing her way through the placement of the pieces making up the march hare on the board before her, she eventually comes across the head, which promptly joins its body and leaps from the board. Betty, curious as always, meanders laconically into the mirror after the hare, whereupon she transforms into a long-haired maiden and begins her lackadaisical trip though Blunderland. After falling down an unfeasibly long shaft and swigging a flagon of “shrink-ola”, the true Fleischer magic begins – and as with his many other works, it is not the end but the means that comprises the magic of the piece. That is to say, we never doubt Betty’s return home – and one sincerely doubts that a home resplendent with a fatherly talking clock would be any more rational than Blunderland, where the laws of logic and physics respectively no longer apply. A truly heteromorphic life form, the Betty Boop cartoon embodies a kind of dream state. Betty appears, then some event triggers a circular narrative, which becomes increasingly surreal (and unfeasible), before Betty “awakes” – that is, returns unscathed to her original setting, before delivering a terminally cute gag with which to finish the cartoon. 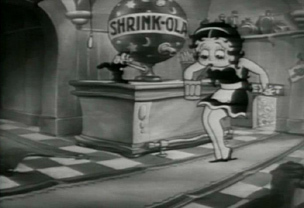 Bearing this in mind, it would seem that the “train-of-thought”, seemingly spontaneous barrage of sight gags that unfold in Betty in Blunderland represent Fleischer’s imagination unwinding over the painted cells as they are projected – one cannot dispute the exuberant, organic immediacy of these works, as Betty flits nimbly through some of the most transmundane scenarios ever animated. In Blunderland, we watch as Tweedle Dum and Tweedle Dee become dual Babe Ruth look-alikes, methodically swinging at each other, until both heads recede to revel white flags, waved in unison. After a bounding dance, a frumpy nurse’s feet suddenly become two dogs, barking viciously at one another. Mythical creatures frolic and play dice as Betty sings amongst them. In short, Betty is a dreamer, encapsulated within a dream, which happens to be spun by Fleischer, an often-unsung pioneer in the field of animation. With the advent of sound, Hollywood accelerated the production of short animated films, which would serve to preface the main features in cinemas. Whilst many studios fought for the status fast being acquired by Disney, there was one other major contender – the studio run by the Fleischer brothers, Max and Dave. The works from this studio (with some exceptions) foregrounded the “artificial, drawn nature of the medium”, and contrary to popular belief, were parallel, even at times ahead, of Disney in pioneering many technical and narrative techniques (1). For example, from 1924 to 1926 Fleischer was producing the first sound cartoons, paving the way for Disney’s much-lauded short Steamboat Willie (Ub Iwerks, 1928). In response to the huge success of Disney’s short, the Fleischer brothers nurtured Betty (as a dog), whose ears eventually changed to earrings, and whose curves became increasingly pronounced. Finally, in the short cartoon Mask-a-Raid (Dave Fleischer, 1931), audiences were presented with the prototypical Betty, “boop-oop-a-doop” and all – a far cry from creator Grim Natwick’s canine lead. Whilst Disney animators at the time were urged to watch Fleischer’s Betty cartoons, perhaps to capture something of the vivacity inherent in his work, Fleischer himself was struggling to fight fire with fire. Disney’s budgets were augmented, and so Fleischer responded with force; the features Gulliver’s Travels (1939) and Mr. Bug Goes to Town/Hoppity Goes to Town (1941) were brimming with artistic verve, but the expenditure overshadowed profits, and the Fleischer brothers went under. While the studio (still employing many of the original animators) continued to produce fine works, without the Fleischer brothers at the helm, the heat had dissipated. Betty In Blunderland is what one might call a “golden-age” Boop adventure. In Blunderland, she is at her freest; whilst in the “real” world Fleischer has woven, there is hardly a lack of dream-like, labyrinthine sketches to be undertaken. In Blunderland, even Betty is overwhelmed. Emerging from her sojourn into the unknown, she smiles, and resumes assembling the puzzle on her living room floor. If Betty’s adventures sometimes seem to lack narrative coherence, there is a recurring dream-like ambience, a kind of child-like desire for the unreal, which underscores the consistently innovative and outlandish animation headed by the Fleischer brothers. Without Betty, the history of animation would not be lacking in complex narrative developments, but it would undoubtedly be missing a certain spontaneous charm.